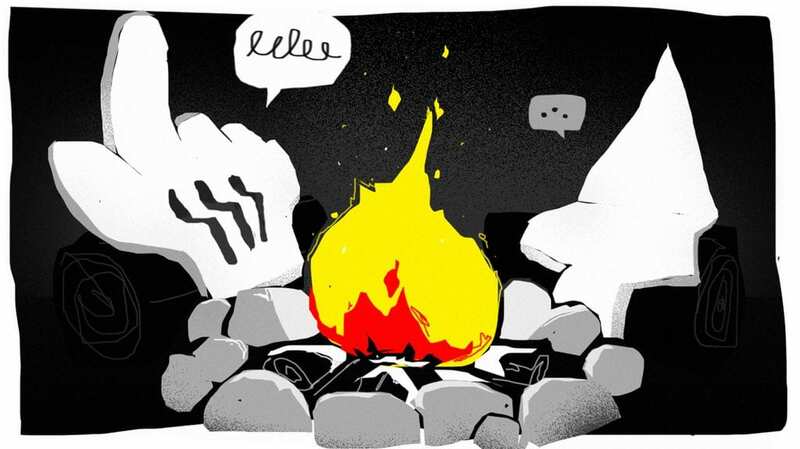 What does the modern campfire storytelling session look like? Illustration by Samuli Lindberg. UX writing creates effective interactions between the user and a website, application or service in every stage of the user journey. It is the copy in titles, menus and forms, CTAs on buttons, hints, error messages and explainers (often called microcopy). Yes, it’s all part of the UX, and not a small one either. This is what it all comes down to: users hate surprises. The first goal of a UX writer is to always make it crystal clear what to expect in each phase of the user journey. Following the three Cs of clarity, conciseness, and consistency will help you add that intuitive storyline to the user experience. Defying the threat of sounding obvious, I’m starting with clarity. Think about it – you don’t want users to spend their precious time trying to make sense of what your product or service is trying to tell them. Pointless jargon and difficult technical terms that only you and your team know are big no-nos. This touches the very core of content strategy: always know who you’re talking to – in most cases, it’s not someone exactly like you. We have quite a low tolerance for obstacles when it comes to websites and other digital products, so you’ll want to make the user flow as intuitive and easy as possible. Seriously, promise to keep it simple. A good rule of thumb is to only publish text that can be understood by a 12-year-old. Unless of course you’re writing for an audience younger than that. Every sentence, every word, every syllable has a job to do. Sad but true, nobody will eyeball every corner of your magnificent website or digital service. Users scan the content in a blink of an eye and skip parts that appear too heavy or complex. Avoid walls of text and instead organize the content into light chunks that are delightful to digest. There’s no reason to show all your cards at once. Too much information is a powerful turnoff, as it overwhelms users easily. This is part of the bigger content design picture. Use CTAs like “Read more“ to indicate how the user can find more detailed information, should s/he need it. If you want to sound like an expert to your coworkers, refer to this as progressive disclosure. Very pro. Especially the third C requires you to see the product or service as a whole. For example, after you’ve chosen to call the desired action “a booking”, “a booking” it shall be until it has been confirmed by the user. Don’t go confusing people by using different words for the same thing halfway through an action. There are some instances where you may want to ease up on this one, because digital UX is encountered on different devices and platforms. For space restrictions alone, copy may need to be separately optimized for mobile and desktop. Overall, a good UX depends on a consistent style and use of words. Remember: users hate surprises. There’s quite a lot to consider once you start packing more than a snorkel on your UX writing adventures. Needless to say, the style and tone of writing should originate from your brand identity. However, the following points fit most cases. Activity is contagious – Use active language to make it natural for users to grasp that activity. Start with the action you want users to perform, and make it stupidly simple to understand. Specific over generic – Descriptive words trump vague expressions that can be interpreted in several ways. However, think about what words your audience prefers and relates to a certain action. Pushy vs. efficient – The difference can be visually small, but huge in impact. Being concise doesn’t rule out kindness or likeability. Positivity drives actions – No pom poms required, just make the user feel like things are moving forward, getting solved, and happening. Flow experienced by the user is the cornerstone of a good UX. Remember grammar – There’s a difference between a colloquial, friendly or upbeat style and plain wrong. Then there’s humor – The easiest way to succeed with humor is to not do it. If that wasn’t enough, check out more UX writing tips in this post on Medium. The underlying tasks of UX writing are to build trust, help the user achieve something, and improve the overall user experience. UX writing tells a descriptive and efficient story for the users to follow on their journey towards an action or a goal – and you will want them to get there. When the user doesn’t need to think, your design is winning. Marketing & comms lad with soft spots for content marketing, employer branding and smooth design.